As Hollywood would have it the world is divided into two people: those forever chasing the popularity they witnessed others experience in school and those popular kids who peaked during their teenage years. Writers (usually) make up the former group, which is why there rarely is a movie that’s written from the viewpoint of the latter (Young Adult being an exception). Writer-directors Andrew Mogel and Jarrad Paul (Yes Man) may have been in the former camp. The D Train is another sad sack comedy-drama about a man who never got over the exclusion/bullying in high school and needs the friendship of the formerly popular guy as some sort of validation. But D Train has added some spice to the mix - Mogel and Paul take what the bromance flirts with to its more logical conclusion. Dan Landsman (Black) never made waves in school and no matter how hard he tries – calling himself as D Money, D Dog, D Smooth, D Train or whatever – he’s still that lost kid roaming the school halls. He feels that familiar pang of rejection when his ‘friends’ say they’re not going for a beer only to see them enter a bar when they think he’s gone home. He advises his teenage son (Russell Posner) not to chase the hot girl even though she’s into him: “It’s probably a joke.” His boss (Tambor) doesn’t take him seriously either, poking his belly with a condescending boop after another pitch is shot down. This is where The D Train jumps the tracks and gets into murkier territory. 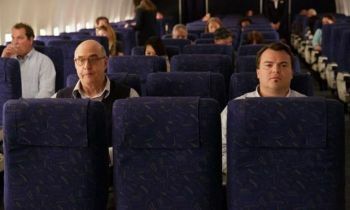 But that Jack Black is terrific in the eponymous role should come as no shock to those who witnessed Bernie; as he proved in that Richard Linklater black comedy, Black is at his best when he’s suppressing that inner rage instead of letting it spew all over the set. He goes for and hits the sweet spot between excruciating David Brent desperation and the nice guy trying just a tad too hard to be liked, between being truly unlikeable but totally understandable. Like Matt Damon in The Informant! Black convinces as a man believing he’s doing the right thing despite his selfish actions; as one lie begets another and Dan digs himself into a deeper hole, Black juggles the everything-is-good façade with growing dread that it will all fall apart. Marsden seems to realise this is Black’s movie and so just stands there looking cool and detached, while Hahn puts in a typically dependable performance. That it neuters its message with an I Learned Something Today recap disappoints – a real un-PC follow through would be that Dan was a loser in school because he is a loser - but The D Train is still a ballsy comedy.